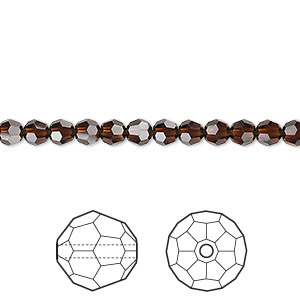 Bead, Swarovski® crystals, mocca, 4mm faceted bicone (5301). Sold per pkg of 48. Item Number: H20-9013CY Have a question about this item? Savor the flavor of French roast in every precision-faceted mocca crystal from Swarovski. Rich, translucent color and aromatic flash to percolate your senses. Pair with Colorado topaz for stunning color combinations. Swarovski crystal components are made in Austria and are considered the finest products of their kind in the world. 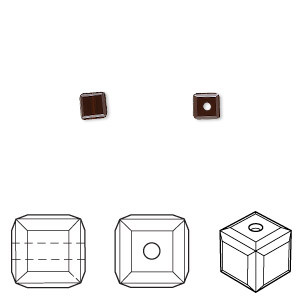 Bead, Swarovski® crystals, mocca, 4mm faceted bicone (5301). Sold per pkg of 144 (1 gross). 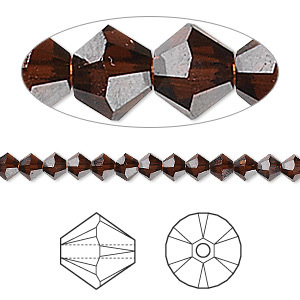 Bead, Swarovski® crystals, mocca, 4mm faceted bicone (5301). Sold per pkg of 1,440 (10 gross).